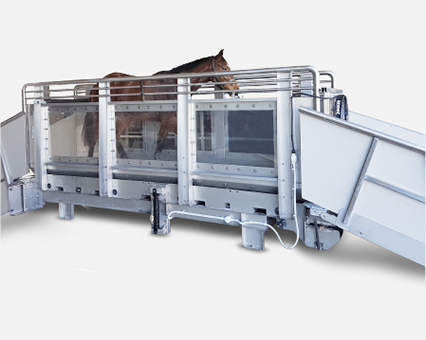 ThoroughTread Aquatic Equine TreadmillEquine Aquatic Treadmill Excellence! 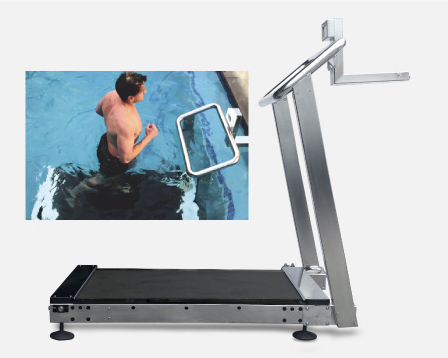 ThoroughTread Aqua is an above-ground, compact aquatic treadmill designed for long-term reliable operation. Its smooth surfaces and user friendly controls, provide a safe working environment for both operator and animal. 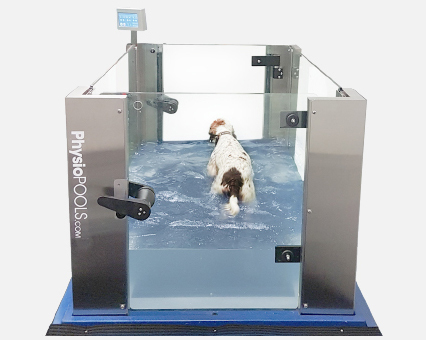 Clear wall panels surround the treadmill to provide a spacious, bright and open environment for animal comfort and allows the operator full visual overseeing during exercise. The ThoroughTread Aqua utilizes the natural properties of water – buoyancy, resistance and temperature. 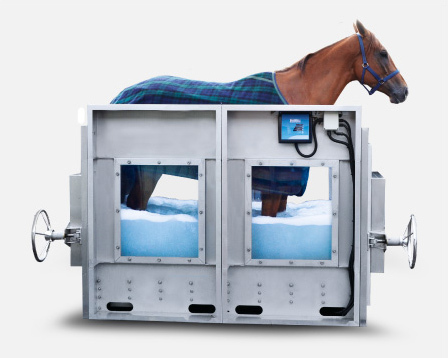 Although aquatic exercise is practiced extensively to assist equine athletes achieve peak performance and rehabilitation from injury, ThoroughTread Aqua provides a compact and efficient way to achieve positive results. ThoroughTread Aqua’s unique structural design enables an impressive 1300mm (51 inches) water depth, providing full buoyancy for even the largest of animals reducing overall weight off lower legs by as much as 90% during exercise – LOW IMPACT EXERCISE. Fast Fill and Fast Empty hydro-pumps ensure efficient use of time throughout session – water depth adjustment can be made at anytime during use. 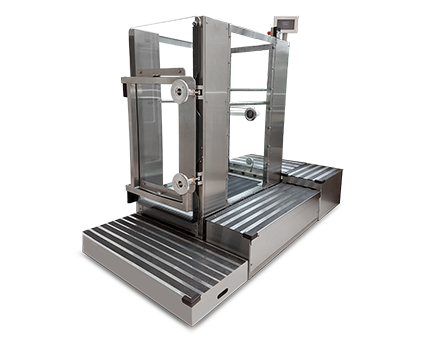 Engineered from 316 Stainless Steel (marine grade) the ThoroughTread Aqua can operate with high concentrate Salt Water and equipped with our Titanium heat exchanger & chiller unit enables a water temperature down as low as 2.0 degrees celsius (35.6 F). 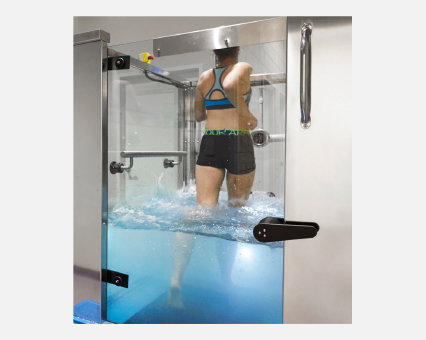 Extensive research shows chilled salt water treatment can be used for many lower leg injuries by primarily reducing inflammation and removing fluid build-up (this build-up causes painful swelling around the injury). The hydrostatic pressure assists with blood circulation around the injury and swelling reduction. Chilled salt water assists in the treatment of: Tendonitis, Arthritis, Desmitis, Hoof injuries, Jar Up, Bursitis/Synovitis, swelling, open wounds and skin infections. 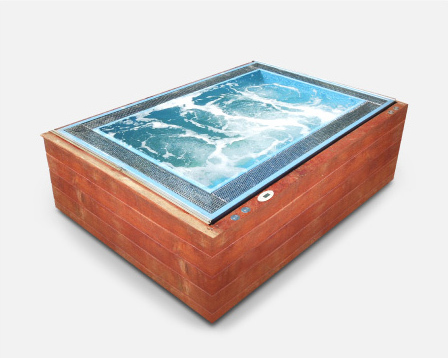 The regular use of chilled salt water therapy immediately following exercise, reduces many of the stresses within tissue well before inflammation develops. All water in the ThoroughTread Aqua system is Re-Cycled. Water is stored and filtered in the storage tank ready for transfer into the ThoroughTread Aqua vessel for use. Following use the water is then transferred back into the storage tank. 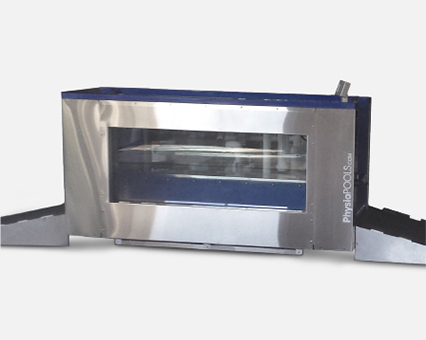 A high performance, variable speed treadmill (conveyor) is driven by an industrial grade electric motor / gearbox / Variable Frequency Drive that provides an effortless speed range from 0.07 Kph to 17.0 Kph (0.43Mph–10.5Mph) controlled via a 256 Colour Touch Screen Control. The treadmill can be operated WET or DRY. 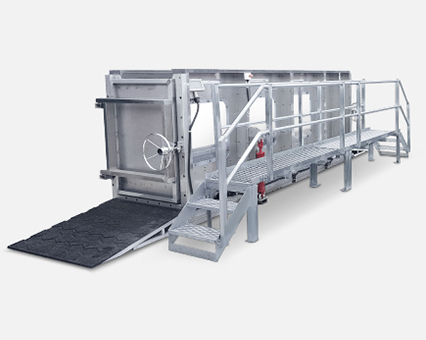 The conveyor deck is shock absorbing providing additional comfort and safety for the animal – this is also the case when the ThoroughTread is in the Incline position of up to 7 degrees.